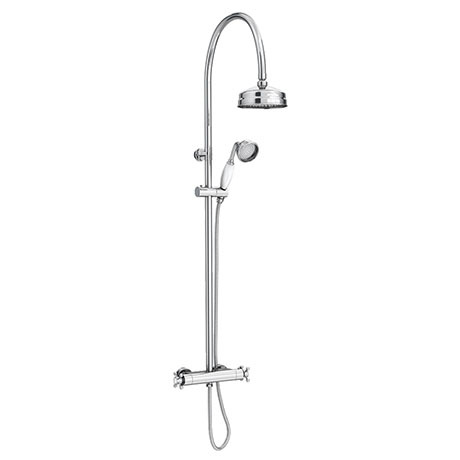 The Chatsworth Exposed Thermostatic Shower, features a traditional design, a stylish overhead, rainfall type shower head and a handset too, for extra flexibility. Constructed from solid brass, the Chatsworth bar valve has two cross-head tap head controls with classic white indices. This complete traditional thermostatic shower package offers fantastic design, which will suit a range of bathroom configurations. Comes with a built-in diverter so you can switch between the fixed head or hand held shower. One fixed head and one handset. Lightweight handset minimises risk of damage to bath and/or shower tray in case of accidental droppage. Classic thermostatic mixing valve of brass construction with built-in diverter and polished chrome finish. Rigid riser with polished chrome finish.